Lake Bunyonyi for independent and low-cost travellers. If you are planning a budget trip in Uganda, here you can find useful information to visit Lake Bunyonyi, in a independent and low-cost trip. You will see the lake if travelling between Kisoro and Kabale, it´s a big lake (25x7 km). 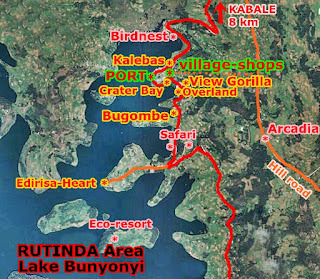 Rutinda is the main village on the southern shores of Lake Bunyonyi, the area where most of the resorts are spread out, also some on small islands. Rutinda´s 8 km southwest from Kabale, on a dirty road, up and down the mountain, but fine for a 2WD (drive slowly). Lake Bunyonyi is a cool (cold nights) and wet area (1.950 m high). Kabale is a dusty, long and ugly town, with the main road passing through. Even dustier now as they are doing road works. Lake Bunyonyi is really near and much calmer. We don´t recommend sleeping in Kabale, but if you have to, there are a few lodges around the taxi-park/buses area. And also a backpackers lodge, Home of Edirisa (12.000 Sh/dorm, 25.000 Sh/room), on the back road near the post and bank (30 min walk west of the center). Kabale is on the main road Kampala-Kigali (Katuna, the Rwanda border is just 20 km south of Kabale). Take cash in one of the ATMs if going to Bunyonyi as no banks there. And also think in shopping first in Kabale if necessary as only one local shop in Rutinda-Bunyonyi. Kabale-Rutinda: shared taxi, 3.000 Sh/pp (1 €), 30 min. It was quick to fill... for once...They leave when full, departure from the bus offices area in Kabale (ask) and from the port in Rutinda. Monday and Friday are the market days in Rutinda, so maybe easier to fill quicker the taxis. Be patient! If you have to hire the car, it will cost around 20.000 Sh. There are many boda-bodas. Price around 4.000-5.000 Sh Kabale-Rutinda. And they are the local way of transport around Bunyoni. The price for a private boat is around 20.000 Sh for a ride, if directly booked in the port, maybe more expensive in the lodges. If staying on an island resort, transport is usually incluided in the accommodation price. Just contact them. Many lodges offer kayaks (around 10 $), but try to negotiate if staying several days. Lake Buyonyi is a tourist spot, getting more and more popular, with many expats and local up-class families, so prices are going up very fast. The prices are often in US$ and not in Shillings. Don´t expect Lake Bunyoni to be a backpackers paradise anymore, it´s more a resort area, but you can still camp for around 5 $/pp and find a dorm for 10$/pp. If it´s low season try to bargain for a room. Note: the weather was quite wet, didn´t feel like camping...and it was really difficult to find a cheap room. 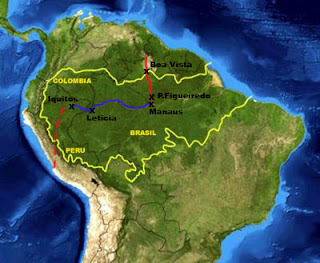 We knew than The Heart of Edirisa was the cheapest place, but it´s a bit far away from Rutinda village (details ahead). 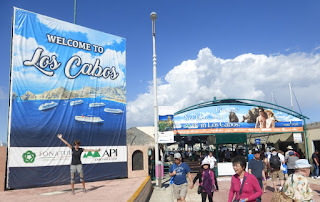 So, we tried our chance with other lodges, closer, on the way, compare and bargain. It worked, in the rainy season. Thanks to Stephen, an old local guide (he´s around the village, you can ask for him or call him +256.774.398.110). He´s nice! Bugombe Island Gateway: where we stayed. Double room: 40.000 Sh (14 €), self-contained . They asked for much more at the beginning (around 65.000 Sh), but we negotiated the price, staying a couple of days and without breakfast and cause the room was still unfinished (no light, only hot water buckets for shower). They are still under construction of new rooms. Also, a garden to camp and tents (cheaper than rooms). Electricity (solar) only in the main area and some rooms (more expensive). The staff is super nice, polite, always offering free peanuts, tea and coffee. And the boss gave us an extra night for free! Very quiet place on the lake, with small jetty. Super recommended! Try to negotiate the price as we did. 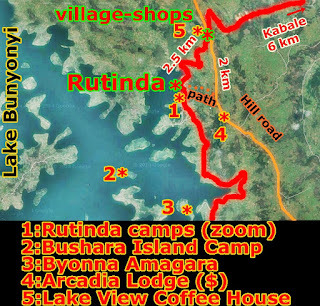 The location is just passing Overland Resort, 10-15 minutes walk from Rutinda village. 5$/pp camping, 20$ tented room. - Bunyoni View Gorilla Packers (www.lovingheartsuganda.com): 5 $/pp camping, 8$/dorm, 30 $ room. - Bunyonyi Overland Resort (www.bunyonyioverland.com ): 8 $/pp camping, 15$/dorm, 45 $ room (shared WC)!Very big resort, well maintened, but prices are quite expensive compared with others. - Crater Bay Cottage: 5 $/pp camping, double tented room 25 $, 65 $ room. - The Heart of Edirisa (www.edirisa.org) : the cheapest place in the area (15.000 Sh/dorm -6$, double room shared WC 20.000 Sh/pp -8$, camping 5.000 Sh -2 $). The place is calm and peaceful, but it´s really basic (specially WC) and the rooms are wet and smelly. There´s a kitchen (good as lack of restaurants). 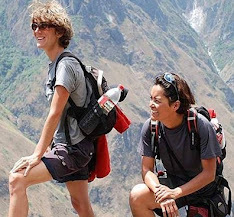 It´s a bit far away by walk from Rutinda with a bif luggage and the access is via a steep path. So it´s better you call them to fetch you by boat at the port.We didn´t stay there. 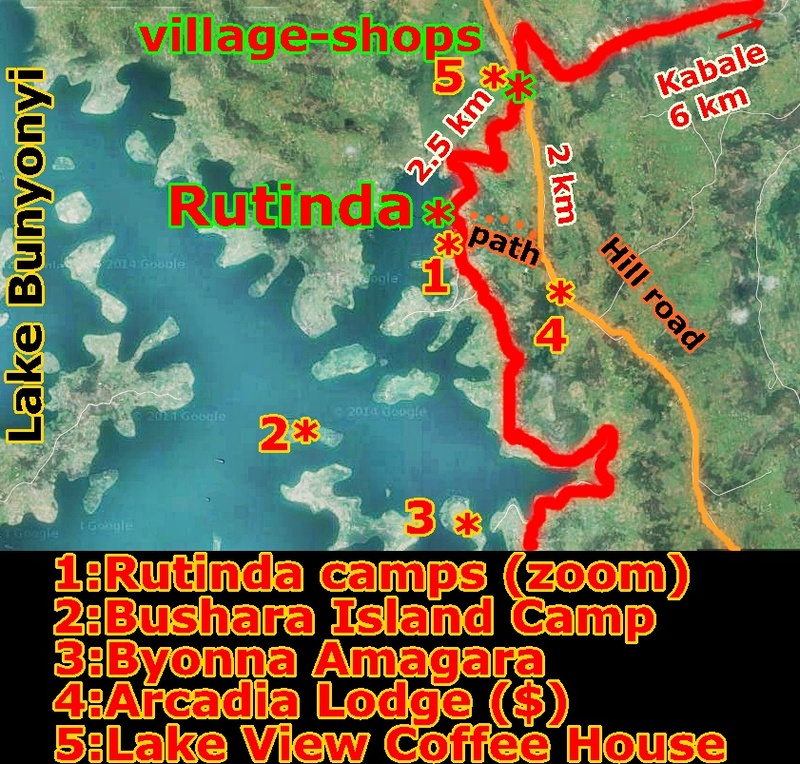 - Byonna Amagara Island Retreat (www.lakebunyonyi.net): 20.000 Sh/dorm (12 people), camping 12.000 Sh/pp, double room 46.000 Sh. - Bushara Island Camp (www.busharaislandcamp.com): sorry, no prices. Very limited offer outside the lodges (prices are usually double or more than in local places). In Rutinda, in the village, just one chapatti-rolex stall and a few super basic restaurants (food is usually only avalaible for lunch... better dont count too much on them). Maybe also some chips. Ask around.Not easy to eat in Rutinda! Cooking in the camp can be better! Only one shop with basic things in Rutinda, you can´t miss it.Always people around buying. And many local pubs in the village! No banks, Rutinda is just a very small rural village. Try to get a free copy of Gorilla Highlands booklet, with maps and some usefull information of the Kisoro-Bwindi-Kabale-Bunyoni area or download it (www.gorillahighlands.com ). Walk around. The area is beautiful. The main road is dirty and doesn´t have heavy traffic, you can follow it. Populated area, many houses and fields everywhere. Friendly people and children. They are always boda-bodas if you get tired. If you continue on the road, passing the lodges, you will get nice views of the lake and the islands. Nice walk! And closer views to the lake than from up hill Arcadia Cottages. Go up to the hill to Arcadia Cottages. From Rutinda, the village, you can walk straight up, following a steep path. Famous for the views of the lake and islands (it´s where many groups go to take the picture you will eveywhere). 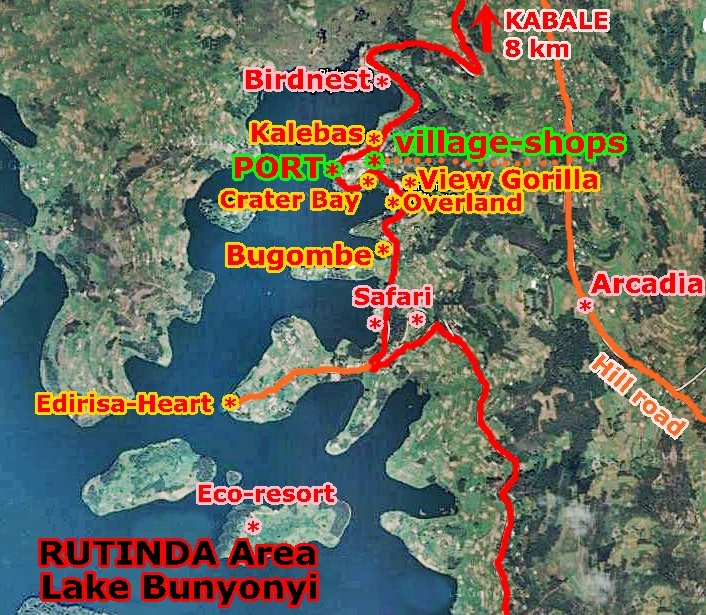 Or you can go by road, it´s 1.8 km from the crossroads on the Rutinda-Kabale road. Or just walk around, wherever is nice. If you need a guide, it´s easy to find one in the village or ask at the lodges. Swim in the lake, but the weather is cool and wet. We didn´t see many people in the water. Even local children.The lake looks clean. Relax and enjoy the peaceful place.